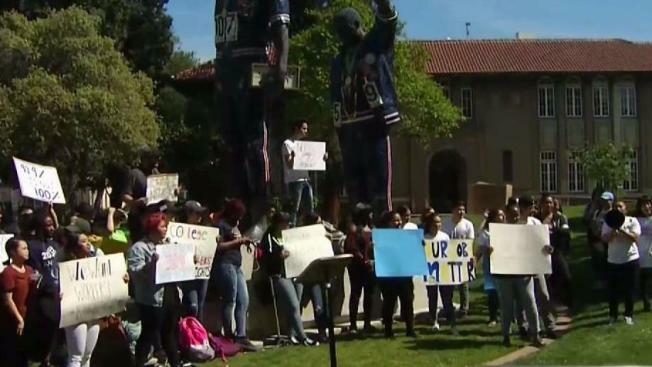 Students at San Jose State held their own May Day rally Tuesday, advocating for student jobs, which they feel are in jeopardy of vanishing. Students say campus jobs are vital in helping them pay for tuition and housing. Nearly 1,000 students work part time on campus to pay for college. One manager at the campus Taco Bell says her job is full-time because her out-of-state tuition is so high. "It's very difficult," Amber Smith said. "I usually have one or two classes in the morning and afternoon, and then 3 to 10:30 I have to work." Next year, the university is contracting with an outside vendor to provide the food service. All students will be forced to resign from their jobs and reapply with the new company. That set off the alarm bells. "It’s difficult working, not knowing if my job is guaranteed," she said. "It causes extra stress that I really shouldn’t have." San Jose State insists no student will lose his or her job with the new contractor. "What I’m guaranteeing is every student who is currently working for Spartan Shops will get their jobs," said Charlie Fass, vice president of finance for SJSU. "Same pay. Same hours." Fass said bidders for the new contract had to agree to that clause. But students say they’re not buying it and don’t want to be forced to re-apply for a job they already have. With 35,000 students and growing, the San Jose State says it needs a new, modern food service provider. Meantime, students say they’ll keep fighting to make sure they don’t get burned in the deal.